How to Cook a Turkey in the Oven: If you are anything like me, you are already thinking about bird day. How will you season your oven roasted turkey? What Thanksgiving sides will you make? Does Thanksgiving dinner have to be the same old thing you make every year? I say no. At least, not quite. I’m not suggesting you cause chaos by serving lasagna on Thanksgiving. But what about taking the standard Thanksgiving dishes and give them a saucy makeover? Thanksgiving purists are happy because all their traditional dishes are represented; the adventuresome eaters are happy because they get to experience those dishes in a new way. This year I’m planning to serve Asian Turkey, fragrant with exotic herbs and spices. I prep the turkey the same way I always do. Yet my rub, and the herbs I put inside the bird, will infuse a soiree of vibrant Asian flavors into the skin and meat. 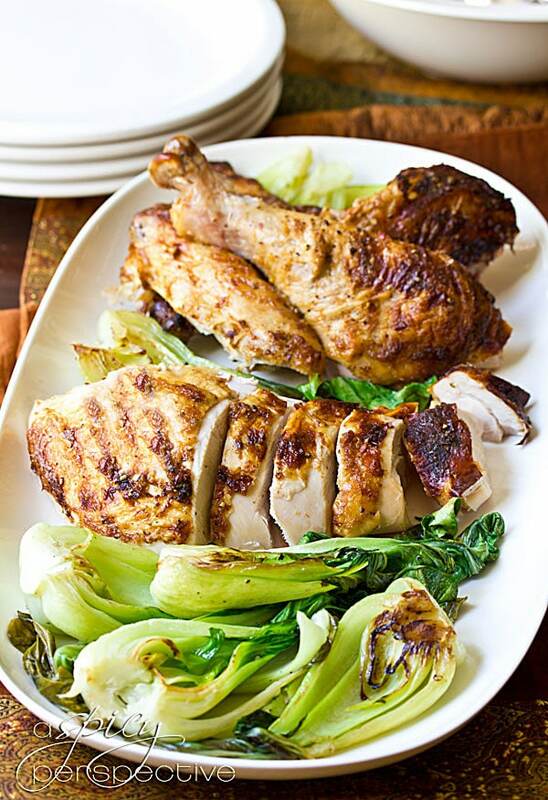 This Asian turkey rub is made with mayonnaise, sriracha, ginger and garlic. Believe it or not, the mayo adds an amazing amount of flavor to the skin and makes it extra crispy. Then I place some Thai basil, lemongrass, ginger, and scallions in the cavity to perfume the bird from the inside out. This method for oven roasted turkey brings additional flair to your Thanksgiving table without overshadowing the other dishes… traditional or not. Before we get to the Asian turkey recipe, I want to share a few pointers for oven roasted turkey. Following these steps can make a HUGE difference in the quality of your bird. Shop for your turkey at least a week before Thanksgiving. Place it in a roasting pan and let it thaw in the fridge several days. This will ensure you don’t end up with a frozen bird Thanksgiving morning. Brining is a great way to infuse flavor into the meat. Prepare 1 gallon of water with 1 cup salt. Feel free to add any herbs and spices you desire. 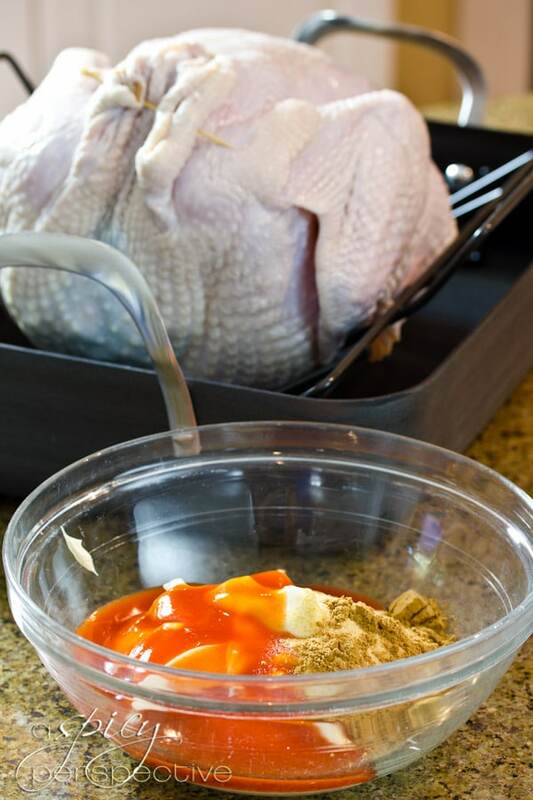 Then place the turkey in a clean bucket and pour the brine water over it. Refrigerate for 24 hours. Drain and dry. If you run out of time to brine–don’t fret. Carefully loosen the skin of the turkey and rub all the meat (under the skin) with salt and herbs. Make sure to do this over the entire bird. Its not quite the same as brining but will still give your turkey much more flavor than simply salting the skin. Whether you brine or not, your turkey’s skin needs to be bone dry before seasoning to make sure in gets crispy. Use clean paper towels to give your bird a rubdown. Stuffing a turkey is for the birds…heh heh! Sorry I couldn’t resist. 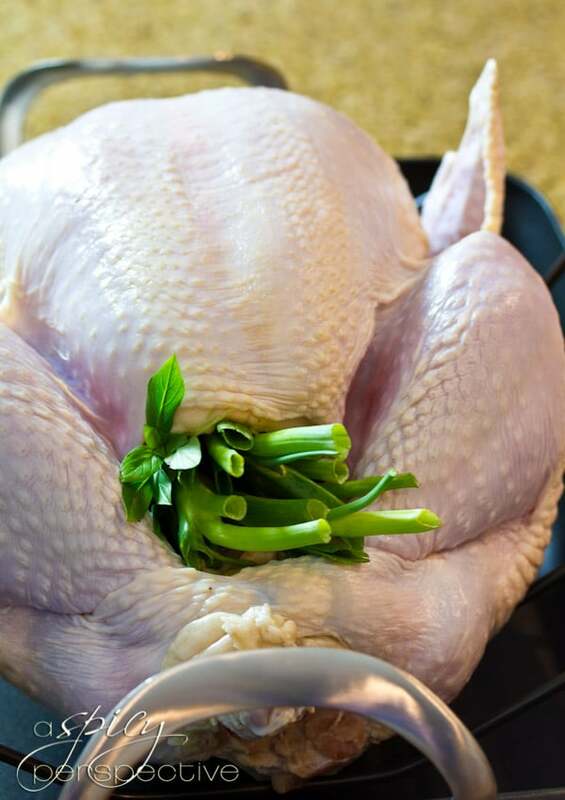 Make your stuffing in a baking dish, instead of stuffing it in the cavity of the turkey. Then your turkey can come out of the oven when the meat is moist and just cooked through, instead of drying out while you wait for the stuffing to reach the right temperature. Once your turkey is thawed, brined, and dried, rub the turkey down with oil, butter or mayo concoction to flavor the skin and make it crispy. Cooking your turkey upside down allows the fat and juices to run into the breasts meat for extra flavor and tenderness. I usually cook my turkey breast-down for the first hour. Then flip it over, re-oil the top and roast it the rest of the way, right-side up. The top will pop back up and brown, for a pretty Thanksgiving bird. After years of playing with the temperature and cooking time, I find I get a juicier bird with crispy skin, if I roast it at a higher temperature for less time–400 degrees F, usually for about 2 hours. This also frees up the oven for other Thanksgiving dishes. After all that, you and the bird need a little rest. I like to allow the turkey to sit for 30 minutes before I slice it. The juices redistribute and the slices tend to come out much neater. 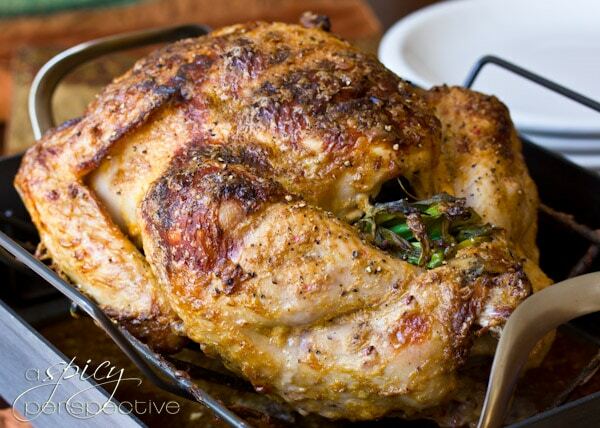 Whole Oven Roasted Turkey with Asian Herbs and Spices. Preheat the oven to 400 degrees F and lower the rack to the lowest position. Dry the turkey thoroughly with paper towels. Stuff the basil, lemongrass, scallions and ginger slices in the main cavity and smaller neck cavity. Close the neck cavity with a toothpick. Most turkeys come with the drumstick tucked under a flap of skin to keep them secure. If your’s didn’t, tie the legs together with kitchen twine. Mix the mayonnaise, sriracha, ginger powder and garlic powder in a bowl. Massage over the entire bird, leaving 2 tablespoons of mayo mix for later. Then salt and pepper liberally. Place the turkey, breast side down, in a roasting pan on a rack. Pour two cups of water in the pan and place in the oven. Roast for 1 hour. Using paper towels or turkey lifting forks, carefully flip the bird breast side up. Rub the remaining mayo mixture over the top. Add additional water to the pan if needed, and roast another 45-60 minutes. You want to interior temperature of the bird to reach 165 degree F in the thigh area. 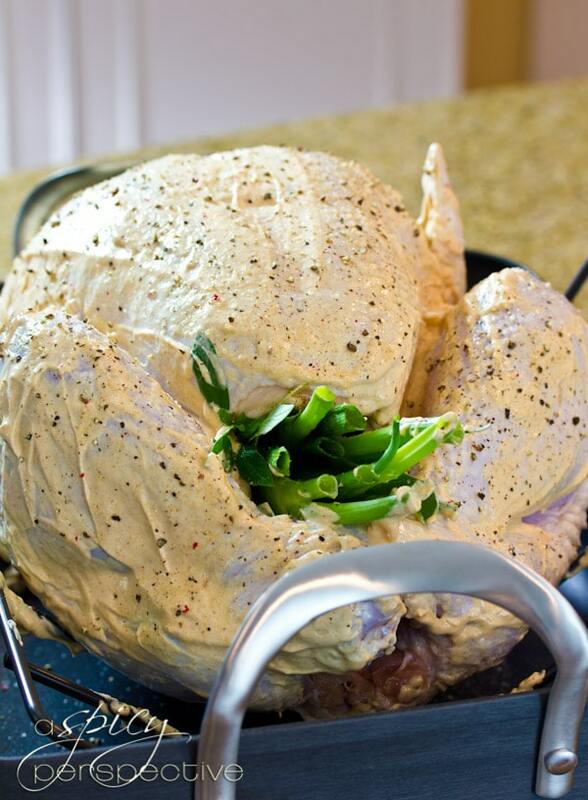 *If the turkey starts getting too dark on top, cover it loosely with foil. Allow the turkey to rest at least 20 minutes before slicing. In all the years I’ve roasted turkey, I’ve never had one so flavorful, moist or delicious. This recipe is a keeper. Everyone was raving about it and so disappointed that the leftovers were so few. Turkey is no longer a once a year menu item. Thank you so much!!! 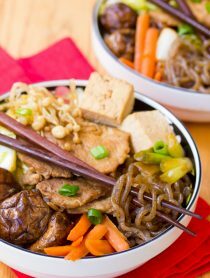 Excellent option for an Asian inspired Thanksgiving! 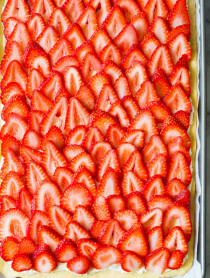 Easy prep and moist even without brining. Third time leaving same comment took 20-30 minutes to type last comment, & 3 times for this to post. Pingback: 10 Tasty Turkey Recipes | Home. Made. Interest. 1) Does it really only take 2 hours to cook the turkey? 2) There is no basting needed for this recipe correct? 3) Do you have a gravy recipe that pairs well with this turkey? The cooking time varies base of the weight of the turkey, but at 400* a 12-14 lb turkey should cook in about 2 hours. And yes, this is a no-baste recipe. As for gravy, the pan juices have a lot of great flavor. You could whisk in some flour and simmer the juices and you would get a really nice gravy with asian flavors. Great recipe! I will try it tomorrow for the first time, but I don’t have a separate turkey roaster. I only have an oven. Should I wrap aluminum oil around the turkey and roasting pan? Now that is a glorious bird for Thanksgiving!! Love stepping out of the box with traditional food, to bad dad still rules turkey day :D Guess I’ll be making this for just me and the guys, too bad pops. I’m thankful for my family and I’m thankful I’ve survived cancer. Thanks! I am thankful for my husband & kids. Not having the greatest family growing up it is what is most important to me. I am thankful for my friends and most importantly, my family! I am thankful for my family, friends, and the roof over my head. This year I am Thankful I am home with my family it came at a lot of costs (Job, Home, Friends) but getting back to be with my family for a while has been really nice. I’m thankful for my husband and for my family. I’m very thankful for my fiance. I am grateful that no one in my family had any substantial damage due to hurricane Sandy. I’m thankful for my family and to finally have a job. I am thankful for my family and that I have a secure job. I am thankful for my health and for my family. I am thankful for my family’s good health and that my husband and I are employed. I’m thankful for my family! I am thankful for my family and decent health. I am thankful for family relationships. Each of ourchildren have found good partners , honest, caring and with integrity . I am grateful that with each pairing they are good for one another. I am also grateful that even though my husband’s health has had its up and downs . He is alive . well and with me. I’m thankful that I get to spend Thanksgiving with my husband. I’m Thankful for family, friends, and God. I’m following you on pinterest. I am thankful that we survived Hurricane Sandy. I liked A Spicy Perspective on Facebook. I pinned your yummy turkey. I am thankful that I live in a country that even though we have differences & the nation is divided down the middle, I can still wake up in the morning knowing that WE, AS AMERICANS, STILL ENDURE! Thank you, And may God bless this great country. I follow A Spicy Perspective by Facebook. I follow BigKitchen.com on Facebook. I’m thankful for family and friends this Thanksgiving season. Thankful for my awesome family and being able to support them. I’m thankful for the opportunity to spend Thanksgiving with family. I am thankful for health insurance. I have to have foot surgery in Decemeber and with out health insurance it would be a financial crisis. I am thankful for my family’s good health. This is cliche but last October my mother was hit by a car while she was walking across the street. Somehow she only (if I can even say that) suffered severe damage to one leg and a moderate back injury; both should heal in time but her walk may not return to 100%, more like 90%. There was no brain damage or paralysis. Whew! So, I’m very, very thankful for good health. I am thankful for my family! I follow Big Kitchen Store on twitter. I’m thankful for my family, especially for job stability in my immediate and extended family. I am very thankful for my family. I am thankful for my famiily and friends and a great job. Thanks for the giveaway. I thank God for my wonderful loving family—my husband, children and grandchildren. I am so thankful that we are all healthy and are looking forward to being together for the holidays. I am thankful that my family made it thru Hurricane Sandy as well as we did….we were “inconvenienced” but survived….Thank you for this contest. I am thankful for my husband and my daughters. I’m very thankful for my family, my kids, and especially my mom, she’s had an incredible life and put up with six kids which still amazes me! i am thankful for my friends and family. I am thankful for my two wonderful children! It’s been a tough year, but we survived! We just got power back after 8 days without from Hurricane Sandy – I am so thankful for restoration of power in our area. I’m thankful this yr for everyone being healthy …all at the same time!!! Thankful that everyone in family is healthy! I’m thankful mostly that my family is healthy. Im thankful for my Daughter, she is healthy, happy, and sweet. I am thankful that I am healthy and able to share my life with my family. I’m also a Facebook fan. I get your email updates. I am thankful for family and friends that love you no matter what! I am thankful for my family, and for having a home this year to host our first Thanksgiving dinner. I’m thankful for great friends and family, and that I’m comfortable in life. I followed you on tweeter. 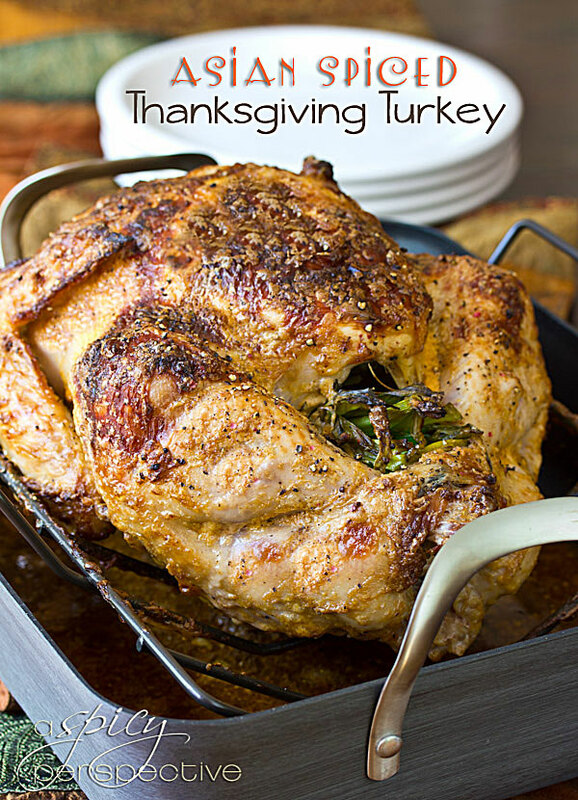 ….And I pinned this..It would be my 1st turkey, if I win bc I do not own a roasting pan. I want to cook this bird for my daughter, who is 2. I am thankful for my family, getting through hard times, and not losing faith. I am thankful that my good wife has not yet been taken and may see another Christmas. I am thankful for my parents and my baby daughter. I’m thankful for all that I have and all that I don’t . I’m thankful for my two wonderful children( even if they drive me to hide in the bathroom on occasion ), my awesome husband and the ability to see God’s grace in the everything. Thankful to have a healthy family with many blessings. I am thankful for God and all that he does to transform lives. I am also thankful for awesome food! I am thankful for my wonderful family, my amazing husband, and beautiful daughter! I am thankful we are able to visit our family in the north this year for the holidays! Fan of Big Kitchen on FB. I’m thankful for my new granddaughter & all my family!! I am so thankful to be celebrating another year with my dad. He has been very ill, and each day, week, month, holiday is a gift! I have been wanting a roasting pan forever!!! That’s gorgeous! I follow BK on FB. I’m thankful for moments with my family. Although our visits are few and far between, each minute is precious. I’m thankful for the health of my family. I am thankful for more than you can image…more than I can list. I Follow A Spicy Perspective on Twitter! I Follow A Spicy Perspective on Pinterest! I LIKE A Spicy Perspective on Facebook! I Follow A Spicy Perspective by Email! 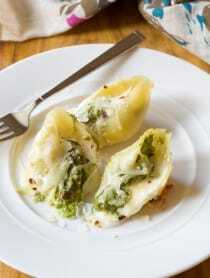 I Follow BigKitchen.com on Twitter! I like BigKitchen.com on Facebook! I’m thankful for my kiddos and family! I like BigKitchen.com on Facebook as Renee Walters! Thanks so much for the fantastic giveaway! 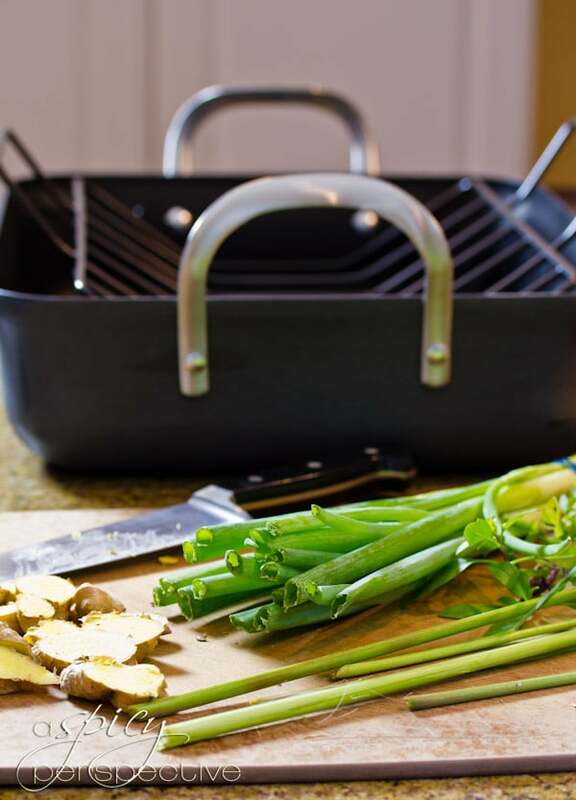 I follow BigKitchen on Twitter as ReneeWalters2! Thanks so much for the fantastic giveaway! I follow you on Twitter as ReneeWalters2! Thanks so much for the fantastic giveaway! I subscribe to Spicy Perspective email at [email protected]! Thanks so much for the fantastic giveaway! I am thankful that my whole family will be together. My daughter is home from the Army! I am thankful for my family as we have faced several health challenges lately. I’m thankful for being here another year with my family! My husband, Family and friends. I am thankful for my healthy family. Im thankful for my family! I’m thankful that my husband’s prostate cancer scare turned out to be nothing. I’m thankful for exciting new ways to cook & eat turkey. Liked you on Facebook as Elena Vo. What an awesome Crab and Gnocci recipe! Liked Big Kitchen on Facebook as Elena Vo. I am thankful for my brother who just returned from his deployment overseas and now is spending more time with the family! I’m thankful for my wonderful family who will always eat what I cook, and for their sense of adventure with food! I’m thankful for my two daughters and their love of cooking during family holidays. I am so thankful for the health of my two little boys. I am also thankful for my family and all the support they give us. I’m thankful for my husband & our sons! I’m thankful for every day! I’m thankful for holding down my kidney transplant another year! I thankful for my husband still having a job in this economy. I Follow A Spicy Perspective on Pinterest. I am thankful my family and home are safe. I am thankful for the health of my family. I am thankful for my health and my family.. and that we will be together on THanksgiving! I am thankful that my family and I enjoy good health. I’m thankful that I finally got married to the man of my dreams. I follow A Spicy Perspective on Facebook. I subscribe to A Spicy Perspective Emails. I am thankful for my awesome family and friends. I’m thankful that my family is together this year for the holidays. I am Thankful for an extremely supportive family who is unconditional in their love. I’m thankful for health insurance. 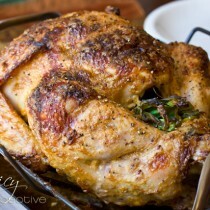 I follow you also on FB ~ Loved all the Info on this Turkey recipe! I ‘like’ Big Kitchen on facebook. I am thankful for my kids finding employment where they wanted. I am thankful I have the best job EVER! This recipe looks delicious! I am wondering….could this work on a whole chicken? With the recipe cut in half. Ok, then I am thankful for my wife. Normally that would seem too obvious but with my sister losing her husband in September, it really is something I remind myself of every day now. I am thankful for my husband, family, and all the blessings in my life! I am thankful for a healthy family. I am thankful for my health and my children. I’m thankful to still have a job and a decent company. So thankful for health, family and good friends – and, dispite all the problems, thankful to live in America! I’m so thankful that GOD has allowed my mother to live. After being in ICU and short-term care she is walking and healthier. I’m truly thankful. I am thankful for the birth of my healthy baby. I follow you on facebook as Rust Hawk. I follow Big kitchen on twitter @rusthawk. I follow Big Kitchen on facebook as Rust Hawk. I am thankful for the bounty in my life and my family. I am thankful for my mom who just turned 80! I am thankful that my father will be visiting for Thanksgiving this year, as I only get to see him about every two years or so! I am thankful for my wonderful grandchildren. I am thankful for my new niece or nephew due to arrive any day! I am thankful for many things but at the top of the list – my family, their health and God’s blessings. Oh…and this recipe…can’t wait to try it! Love this recipe. Gives a little twist on the traditional turkey, which might be a little unexpected from everyone, but delicious, nonetheless! Thankful for my family and our health and for God’s blessings. I would never think to use these flavors for turkey but I love the idea! Great tips, Sommer. What a cool idea! Very new approach. I liked a spicy perspective on facebook! I’m thankful the health and happiness of my family. It has truly been a stressful year but I couldn’t do it without the people surrounding me. I pinned your beautiful turkey to a board called THANKSGIVING on Pintrest. I am thankful to be alive. I had a terrible accident on July 9, 2012. I spent 3 weeks in a coma, 10 days in a step-down unit and 4 weeks at a rehab center, I am currently getting 2 weekly physical therapy. I am starting to walk without my walker. It has been a long haul. I am so thankful for my family and friends and for the good life we have, for the delicioua meal we’ll share on Thanksgiving. How very lucky we are! I am thankful for a healthy family! Thanks for the giveaway. Your turkey recipe looks delicious! All of your tips are helpful too! I’m a newlywed and this will be my first Thanksgiving that I’m hosting. I don’t have a turkey pan/roaster set yet, so this would definitely be wonderful to have. Thanks for the opportunity and for hosting the giveaway! sorry…please delete this duplicate message. I am thankful that my family and friends who are still in the Northeast are all safe. I’m thankful that this year, a hurricane didn’t hit Florida. I’m thankful for my health and my family. I’m thankful for the friends I made in Oregon. I pinned the post and put it to facebook. Not to win, so much as to start curating a list of fun and unusual Thanksgiving dishes. I am trying to get a good list together, so keep me in mind! What a wonderful giveaway and recipe. I’ll be making my very first turkey this year. I know, I know…I’m spoiled. I usually goes to my Parents and they prepare everything. Since they are not hosting this year, I’ll be visiting my In-Laws and bake my first turkey. This roasting set would comes in handy. I am thankful just to wake up each day and know I still have all of my family safe and in good health. I pinned this on pinterst. I am thankful for all the joyful people in my life. Followed Big Kitchen on Twitter! Liked Big Kitchen on FB! Shared the giveaway on FB! I am thankful for the love and grace of my family! I am thankful for God’s Grace, His Mercy, Faithfulness and Love. I am thankful for my friends and family, for my health and so thankful and proud to be an American and able to celebrate Thanksgiving in this wonderful country. I get A Spicy Perspective email updates. I follow BigKitchen on FB. I am so thankful for my husband’s medical tests coming out better than expected! My first year of marriage and all the fun but challenging times it entails! I shared this link on Facebook. I Follow A Spicy Perspective on Twitter. I Follow A Spicy Perspective on Pinterst. Thankful after thirty years I could retire this year. I’m so thankful for the many Thanksgiving holidays I spent with my Mom. She passed away in August and will be missed greatly this year. I Follow BigKitchen.com on on Twitter and left a tweet. I Follow BigKitchen.com on Facebook and commented. I’m thankful I found a new way to use turkey. I love the nontraditional flavor profile here. I am thankful for my family, and for all the people who survived hurricane Sandy, and for all the generous people that are helping them out. I’m thankful for my health! I am Thankful for the Greatest Wife, Greatest Two Sons, Greatest Daughter-in-law, Greatest 3 Grand Kids and for living in the Greatest Country in the World!! I am thankful for my lord and savior and my wonderful family. I’m thankful that we have stayed a strong Christian family through all the trials of the year, and we are all in good health if not healthier. I follow Big Kitchen on Twitter. I like Big Kitchen on FB. I’m thankful that I get to spend Thanksgiving with my family this year! Every day I am thankful for all the extensive traveling I have done! And, I am HOPEFUL that one day, I can do more!! This turkey looks SO amazing, Sommer! I am loving everything about it. This post makes me so happy! I’ve always loved November, but now that we’re about to have a baby any day now, I couldn’t be more thankful for everything we have. I cannot wait to celebrate thanksgiving and carve into a beautiful turkey like this with loved ones. I am so thankful for my husband of 31 years, he has been there for me through many trying times, supported me, & is my ROCK~! I have so much to love about him, he proves it to me daily. I am so lucky to have such a wonderful man in my life >>>> that is why I am thankful for my husband! I just watched a program last night on PBS about the science of cooking a turkey. They talked about brining, etc. Yours looks great and this giveaway is rockin’! I Follow A Spicy Perspective by: Twitter! I am thankful for so many things. But mostly I am thankful for my children. They are grown and beautiful and I love them. I follow big kitchen on fb and twitter! So thankful for my family and friends, life wouldn’t be amazing without them! A husband who selflessly serves in the USMC. I have pinned it on Pinterest. I’m thankful to have found this wonderful recipe!! DEFINITELY going to try this one! Pinned on Pinterest! This looks great! I am thankful for joy filled kiddos and good health. And friends like you who post such utterly delicious recipes! I’m no Thanksgiving purist – would LOVE to eat this bird!! I am SO thankful for a gracious God and the blessing of my family! great looking Sommer! And awesome giveaway! I’m thankful for having a good job, my health, and friends and family close by. I follow A Spicy Perspective on my Google Reader! I liked Big Kitchen on Facebook! Although I will miss my family back in Pittsburgh, I’m thankful this year for starting new family traditions with my fiance and his family! I’ll be cooking dinner for them, and I could totally use this roasting pan, as I don’t have one!! I love this! Such wonderful flavors that must taste out of this world amazing! Ooo!! Loving this twist! The sriracha must be a perfect complement! I’m thankful for the opportunity to live in a beautiful state. I am thankful that I am alive, fairly healthy and that I got my AAS degree. What a terrific post! I’m thankful for my sweet family and all that we have. I am thankful for my healthy family, and my house being intact after living through Hurricane Sandy at our home on the Jersey Shore. I’m thankful to be visiting my family for Christmas back home with my new hubby! I’m thankful to have supportive Parents that don’t judge me for the choices I’ve made in the past and the ones I make in the present. I’m so thankful for my family and friends. They keep me sane in this crazy world! I like A Spicy Perspective on Facebook. This year I am thankful for all my friends and family, and my father who almost didn’t make it through the year with us. I’m so thankful that he’s here with us and doing well!